As entertaining as the theory is, though, it's probably not true. In HBO's official behind-the-scenes featurette for the episode, showrunners David Benioff and D.B. 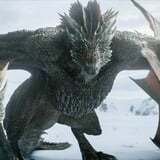 Weiss explain that the dragons - Drogon included - actually like Jon; Drogon's expression is one of approval, not disapproval. "Seeing Jon and Dany on the dragons together is a Jon and Dany moment, but it also seeds in the idea these creatures will accept Jon Snow as one of their riders," Weiss said. It's not a look of hostility, then, but an odd moment of acceptance into the very exclusive dragon-approved club - even if Jon is still incredibly awkward around the dragons.